Come and meet the Each Way Matcher. 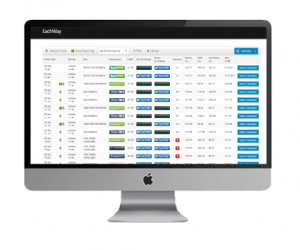 This tool has been created to help you maximise your profits from each way races. There are some fantastic reload offers around but if there wasn’t, would you still be able to make much of a matched betting profit on the horses? Thanks to the team at OddsMonkey, the answer is: yes! Our developers have created the Each Way Matcher. We caught up with Director of Product Development and Customer Engagement, Peter, who’s been matched betting for 9 years, to find out a little bit more about the EachWay Matcher including what it does, where the benefits are and how it could fit into your matched betting strategy. What is the Each Way Matcher? The Each Way Matcher is a great piece of software which analyses thousands of odds and each way prices from over 50 bookmakers and compares them with the opposing win and place bets from the betting exchanges to deliver win-win opportunities, whatever the outcome. The software ensures OddsMonkey members have the potential to earn an extra tax-free, risk-free income, on top of their current matched betting profits. Some beta testers have reported earning up to £700 extra using the Each Way Matcher. What is each way matching? It is basically placing an each way bet on a horse and then laying the opposing win and place bets off on the betting exchange. It is similar to normal backing and laying, but when we bet each way, we need to lay both the win and place (eachway) part of the bet. How does it differ to arbing? If you’re familiar with OddsMonkey’s OddsMatcher, you’ll know that arbs are clearly highlighted at the top. This shows us that the back price is higher than the lay price. Straightforward arbitrage betting, based on the win only, needs the back price to be higher than the lay price to guarantee a profit, whereas in each way betting, the win price of the horse doesn’t need to be higher than the win price at the exchange because the value is taken from the place element instead. The arb occurs on the place part of the bet. The reason for this is that bookmakers’ each way terms are a fraction of the starting price (generally 1/4 or 1/5 of their starting price). They are not linked to any type of probability. A betting exchange is totally different. It’s a marketplace where the odds are calculated more by probability and market sentiment. So we can often find a place arb, this where the bookmakers price for the place part of the bet is higher than the actual probability (odds at the exchange). Read our post to find out if it’s ever ‘safe’ to arb as part of your matched betting strategy. What are the benefits of the Each Way Matcher? The Each Way Matcher is great to use on accounts which are ‘gubbed’ (restricted) from participating in offers but are not limited from betting on events. You can also use it to get a higher value return from bookmakers’ free bets and use it to put on qualifying bets with lower losses (especially good on getting low loss qualifiers for 2nd / 3rd place refund offers)! When extra place races become available, the Each Way software really comes into its own. You can quickly filter to show only horses in that race and decide whether the technique of covering the field is worth doing. I have used this a number of times while trialing it and have been able to quickly decide if an extra place race is profitable. How exactly does the Each Way Matcher work? • It analyses data from all horse races which are covered by the bookmakers and the betting exchanges. • Ranks the data to show which horse will give you the highest profit at the current odds. • Does all of the calculations for you. The calculator pre-sets to the maximum stake which is possible to gain the maximum profit based on the the current lay liquidity in both the back and place markets. If you want to change your stake, put in the new stake amount and press recalculate. • It allows you to filter by bookmaker, betting exchange and for certain races you might want to bet on. This is handy if there’s an offer on, like ‘refund if the horse finishes second’ or ‘free bet if the horse wins’. • Direct links to the applicable market make placing the bet quick and easy. It means you don’t have to waste time searching around for the correct market. More time to place bets and make more profit! Could the Each Way Matcher fit into a matched betting strategy? It can be used any day of the week – not just when the big races are on!! It is fairly typical to be able to make a good daily profit by using the Each Way Matcher alone! The software is an excellent resource for accounts which are restricted from bonuses but able to place normal bets! When extra places come along, you can quickly filter the race and use more advanced techniques to deliver a guaranteed profit, such as covering the whole field or part of the field. See the guide for more info. Is it a standalone tool or should/could it be used with other tools? It is a standalone tool, but OddsMonkey members don’t pay anything extra for it! Use alone or alongside our other Premium products. Would you recommend each way matching to newbies? I would say it is an advanced tool which will suit more experienced matched bettors. The processes are similar to the backing and laying with ‘normal’ matched betting, but with more markets involved and quicker moving odds. There is also the fact that horse withdrawals could potentially lead to less places being paid (which is why the guide should be thoroughly read before attempting). 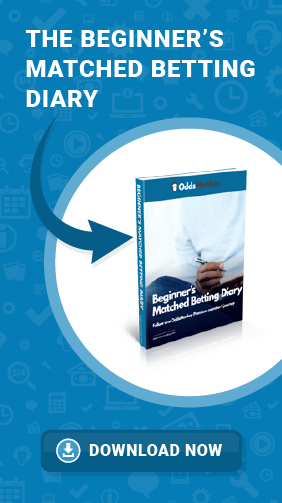 As well as OddsMonkey’s products and features, our Premium members also get access to guides in our training section. • Use on accounts that are not allowed bonuses but have no betting restrictions. A great use of gubbed accounts!! • Start small, finish BIG. Even the most advanced matched bettors should practice with smaller stakes until they become confident. Don’t run before you can walk with the Each Way Matcher. • Combine offers. You can often find matches on the Each Way Matcher which will lose you less (or in some cases make you a profit) than a normal qualifying loss. For example, SkyBet’s ‘refund if the horse finishes 2nd or 3rd’ can often be found with lower loses on the Each Way Matcher as opposed to a standard match. • Great if you want to cover the whole field. The Each Way Matcher comes into its own when extra place races are offered. Not a Premium member yet? Why not? Click here to find out more and start using the Each Way Matcher today!